Edison area residents are invited to a Landowner Rights Workshop for homeowners near the Pilgrim double oil pipelines’ proposed route in the utility corridor that runs through Edison neighborhoods from Inman Ave to Grove Ave to James Street. The event will be held at the North Edison Public Library on Tuesday March 7th, at 777 Grove Avenue, Edison, NJ, 08820 from 7:30-9 p.m.
Presenters are Lynda Farrell of the Pipeline Safety Coalition and Matt Smith of Food and Water Watch. The event is co-sponsored by the Rahway River Watershed Association. The Edison area is part of the Rahway River Watershed. In addition, the NJ Sierra Club is co-sponsoring the event. 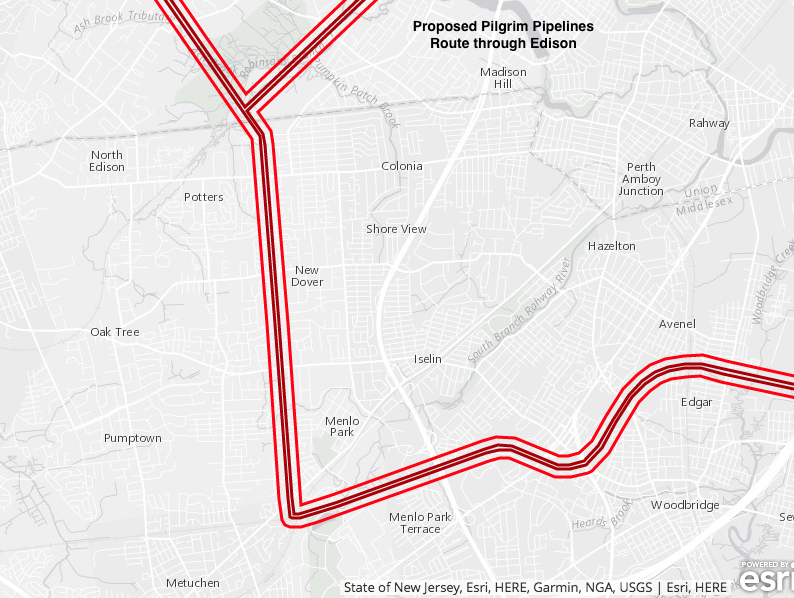 Pilgrim Pipeline Holdings, LLC plans to run double petroleum “hazardous liquid” pipelines starting at Albany, N.Y., crossing into New Jersey at Mahwah, continuing to Scotch Plains, where it would split into 2 branches, one going to the Linden, NJ oil refinery and one through Edison to the port area at Woodbridge. The pipelines would carry crude oil south, and refined oil products such as gasoline north. Pilgrim has filed a permit application in NY State and has held preliminary planning meetings with the NJ Department of Environmental Protection. Pilgrim Pipeline, a private company, is not a utility, yet Pilgrim has sent letters to property owners implying that it has automatic permission to enter private property to survey. In reality, Pilgrim needs an owner’s signed permission to enter private property. Oil from North Dakota is currently transported by train to Albany and then transported by barge down the Hudson River. “There is no need for a commercial oil pipeline, “ said Kathy Abbott of the Coalition Against Pilgrim Pipeline. “ NJ residents will not see any new supplies of cheaper gasoline or home heating oil from this pipeline.“ Abbott is a graduate of JP Stevens High School, which is near the pipeline route in Edison. “Meanwhile, the risk to property values is enormous. Hundreds of oil pipeline leaks are recorded by the U.S Pipeline Hazardous Materials Safety Administration each year. In addition, the utility right of way of the planned Pilgrim route is already crowded with natural gas pipelines that could be disturbed by the digging of the two oil pipelines,” said Abbott.